Danel Telleno is a Dunmer and a master craftsman. He will help train you in enchanting, alchemy, and provisioning to earn a certification. You must go to the Danel Telleno that is in your character's faction. I have a few questions. "Certainly. Please specify." How did you become a master crafter? 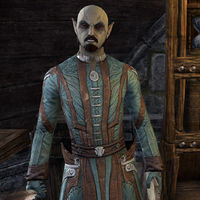 "Decades ago, before all the trouble, I was a renowned chef in Cyrodiil, I had engaged an exclusive contract to provide the Mages Guild in their travels, providing food and drink that wouldn't spoil when carried through portals." How did you learn enchanting and alchemy? "Broiling fish, forging glyphs, or mixing potions - it's all recipes and ingredients. I proved the theory when I joined the ranks of the Mages Guild. Mastered both crafts within three years. Not that I'm bragging." This page was last modified on 8 July 2018, at 06:45.